When you lose a tooth from gum disease, it does a lot more than simply leave a hole in your smile. Missing teeth can complicate everyday activities like chewing, speaking, and more. In addition, although many of our patients do not realize it, a missing tooth can impact the overall health of the entire mouth. When a tooth is in place, the frequent pressure from chewing acts to stimulate the gum tissue around the tooth. Just like using your muscles causes those muscles to bulk up and remain firm, using your teeth keeps your gum tissue healthy. In contrast, when you lose a tooth, the gum tissue surrounding the area where the tooth was can eventually begin to deteriorate from lack of use. This means that you will notice a change in the overall structure of your gum tissue. Fortunately, you are not without options when it comes to keeping your gums healthy. Many of our patients ask us what they can do to keep their gum tissue from deteriorating. One option we offer is a bridge. 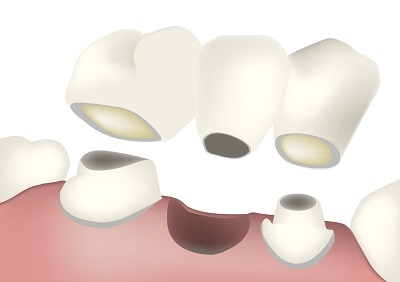 A dental bridge will span a hole in the smile, using a false tooth to fill in for the missing natural tooth. This does more than just act as an aesthetic improvement. The false tooth will look and operate just like a normal tooth, meaning that it will help keep the gum tissue healthy. So if you are missing a tooth, come see us about getting a bridge. Using the latest in dental technology and procedure, we can fashion and install a bridge in a very short amount of time. Then, your gums will stay healthy, and your smile will be complete. As always, we are here to help you. So if you have any questions, please contact us.